‘Harry is done now,’ she said at the London premiere of the play. Anyway, while you try to stoically process this piece of information, JK Rowling also celebrated another milestone, her 51st birthday. But what do you get a woman whom, outwardly at least, looks like she has pretty much everything you could possible want? 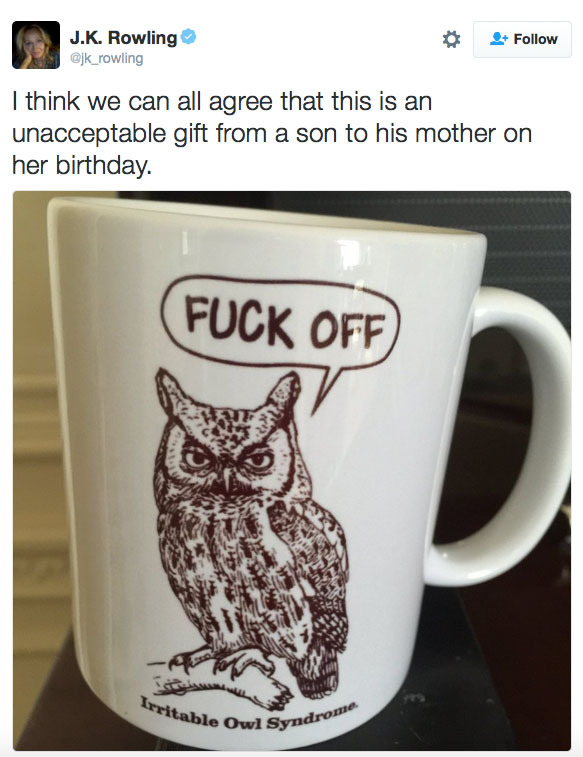 JK Rowling shared the picture of the mug she was given by her son on Twitter and it’s a proper goody. The photo shows a pissed-off looking owl suffering from ‘Irritable Owl Syndrome’, saying ‘f*** off’. Just what mum wanted, right? ‘I think we can all agree that this is an unacceptable gift from a son to his mother on her birthday,’ she wrote in the tweet. 10 points to you sir. And 10 points to JK Rowling for winning at Twitter, again.